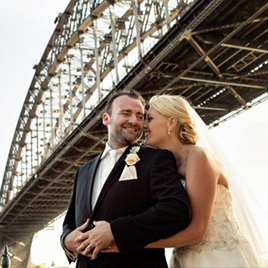 We met for the first time up at Barzura in Coogee on a Saturday morning in October 2012. I didn't end up meeting any of the other guys as I knew Mark was worth getting to know more. We moved in together after 11 months, engaged a year later, married in 5 months and now have a beautiful daughter Addison. We have been together for 4 years yet we can't remember life without each other. Although we took a bit longer to find 'the one', once we did it all fell into place so naturally. We are both so glad that we found each other and grateful to RSVP for giving us the platform to do so.